OPIDIN is meant as early warning system for the habitants of the Inner Niger Delta and all people making their living there. An extremely high flood may cause problems at a local level (e.g. flooding of houses), but the consequences of an extremely low flood are much more serious. 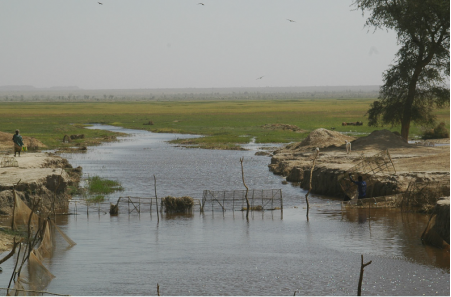 The low floods in the 1980s were a disaster with a very low production of rice and fish. The potential users of OPIDIN may be assembled in 13 categories. Forecasting the flood level in August may help, for instance, fishermen and herders to plan their activities, but for rice farmers this information comes one month too late. Moreover, for planting rice the expected rainfall is more relevant. Global forecasting of rainfall are available; see meteo. 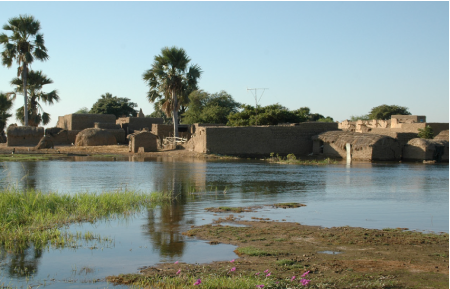 The recent rainfall in the Upper Niger Basin will be included in the evaluation of the flood forecasting such as given in the weekly bulletin. 1. Habitants of the floodplains. 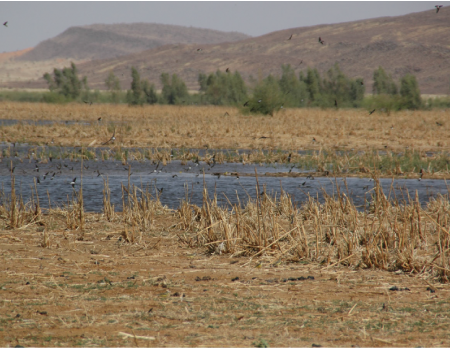 People in the Inner Niger observe the daily rise of the water level between July and October, but they cannot forecast till how long the water will rise and when the peak is reached. OPIDIN gives this essential information. All old settlements in the Inner Niger Delta are on high grounds so they are not flooded even at the highest floods. Since 1969 the floods have been 1-2 m lower than these extremely high floods, and some people have settled on lower grounds. These high floods seem to have disappeared from the collective memory. OPIDIN gives “an early warning” to those people having built houses on grounds being prone to flooding. 2. Rice farmers on the floodplains (“submersion libre”). Farmers in the southern Inner Niger Delta grow a rice variety (riz flottant or floating rice) which is well adapted to grow upwards with the rising water during the flooding. They sow the rice grains before the first rainfall in the hope that the rains come before the flood and makes the rice sprout before the flood arrives. After a flooding period period of about 3 months the rice can be harvested. Farmers in the Inner Niger Delta have to decide where they should plant their rice. During the Great Drought (1968-1993) many farmers decided to give up their traditional rice area and start to reclaim new ricefields lower down in the inundation zone. OPIDIN cannot help the farmers to decide where to sow their rice, but can forecast the flood level and thus, indirectly, their yield. 3. ORM et ORS (“submersion semi-controlee”). Opération Riz Mopti (ORM) and Opération Riz Segou (ORS) manage large areas near Mopti and east of Segou, along the Niger River. There is no active irrigation. There are dikes and sluices to delay the flooding, if necessary, and manage the water level during the deflooding. Hence it is a polder (casier in French), but the water management is passive: if the flood does not rise enough, the area remains dry. Thus, as for the farmers on the floodplains, OPIDIN is of limited use. 4. Rice farmers in irrigated areas (“submersion controlee”). OPIDIN is hardly of interest for people growing rice in irrigated areas within the Inner Niger Delta (for instance in small irrigated perimeters) if the irrigated fields are on high grounds and the water is pumped from the Niger River nearby. 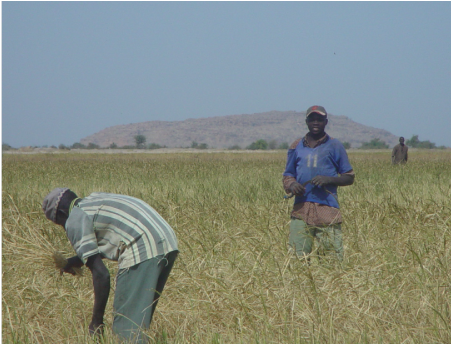 However, irrigated rice fields have also been constructed in recent years on the floodplains itself. 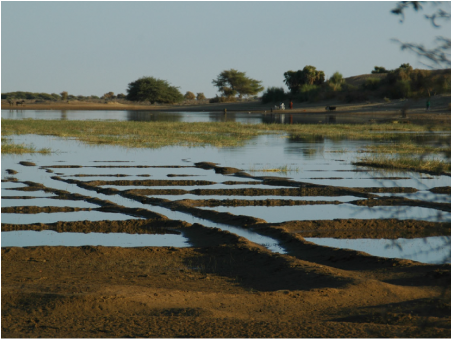 In the latter case dikes around the irrigated fields have two functions: (1) keep the water within the fields (for which a low dike is sufficient), (2) keep the water out when the floods are high (for which a high dike is needed, certainly if the site is situated low on the floodplains). OPIDIN may warn the people in time if a high flood is expected (so they can take precautionary measures to defend their dike). 5. Farmers on the emerging grounds during the deflooding (“zone de décrue”).People grow crops and vegetables on the emerging, still wet grounds. The time of deflooding is highly variable and differs several months between years, especially in the northern part of the Inner Niger Delta. OPIDIN could predict already in August when an area will be deflooded between January and May. 6. As 5, but in shallow lakes and depressions (“bas fonds”). People also grow crops and vegetables on the emerging grounds in shallow depressions and larger lakes. OPIDIN will be of a limited value for these farmers, since the water level in these water bodies will usually be not connected to the river system, by which the decline of the water level is not determined by the declining water level in the river system, but by the evaporation in the isolated water bodies. However, OPIDIN is in another way relevant for farmers in these lakes, since it may forecast whether the flood will be high enough to fill the lake. 7. Water managers (e.g. large lakes in northern Delta). 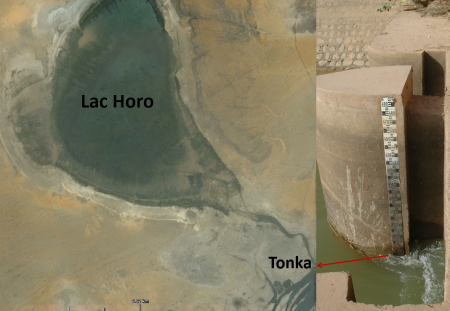 The water level in Lac Horo is artificial since a sluice has been constructed in the creek connection between the Lake and the Niger River near Tonka. The way the area is exploited by fishermen and farmers varies during the course of the season and depends on the water level. The water manager has to take into account the different, partly contradicting interests. OPIDIN may facilitate the decision process since the expected flood curve at Niafunké near Tonka may already be predicted months before. The same applies for Goundam (Lac Faquibine). 8. Livestock. Millions of cows, sheep and goats migrate into the Inner Niger Delta during receding water where they feed on dried-up floodplains. The majority of the floodplains of the Inner Niger Delta is covered by four floating aquatic grass species: wild rice, floating rice planted for consumption and two plant species locally known as didere and bourgou. 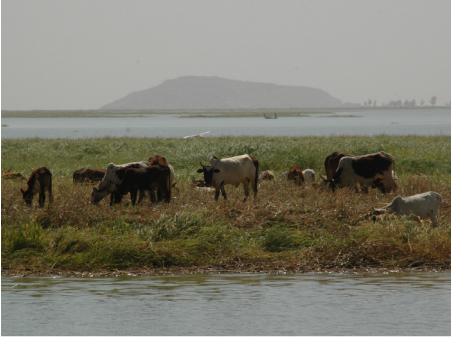 As water levels decline, these plants, especially bourgou, offer a good food resource for the livestock during the long dry season. 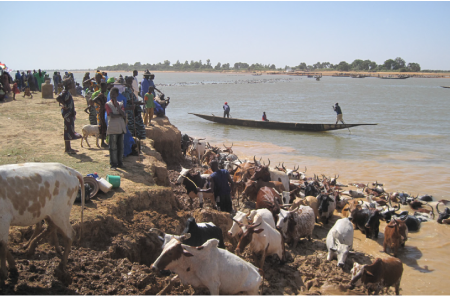 OPDIN indicates when the floodplains will become available for the livestock, but also what they can expect about the food supply (directly linked to the flooding: a higher flood results in a higher bourgou production). 9. Fishery. Most fish is captured in the Inner Niger Delta during the deflooding when the plains are drained and all fish get concentrated in the creeks and last remaining, isolated water bodies. The fish campaign is usually at a maximum in January-March. In the present situation fishermen invest in new nets or a new boat as soon as it is obvious that the flood will be high and thus also their captures. OPIDIN allows them to make these decisions one or two months earlier. 10. Transport. 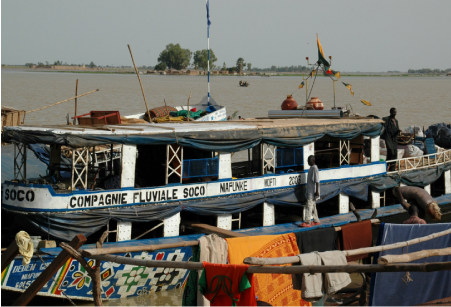 The Niger river plays an important role in the transport of goods and people. 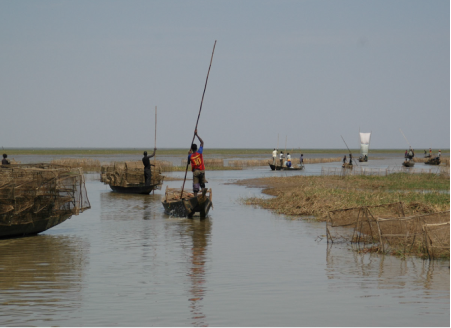 Particularly during the wet season, boats are the most popular means of transport in the Delta. Not only does the river transport allow people to reach remote places, transport by boat is relatively inexpensive compared to road transport. OPIDIN can be used as a tool to indicate the length of the navigation periods for boats of different size. 11. Local authorities. the Governor of Mopti has to decide in October when the cows are allowed to enter the Inner Niger Delta. 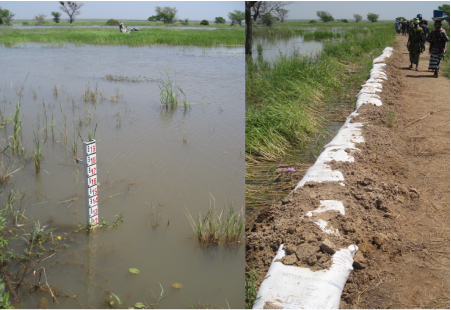 OPIDIN can assist to fix the dates at which the water level has fallen enough to allow grazing, without causing problems for the rice farmers. 12. 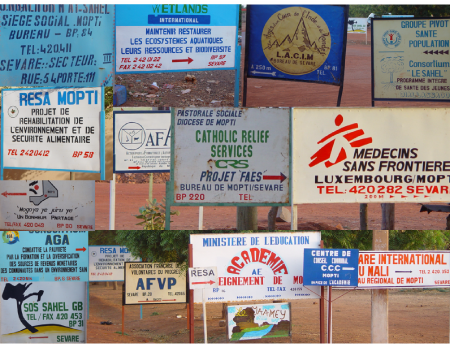 National and international aid agencies. Floodplains are extremely productive biological systems and nearly everywhere in the world attract for this reason many people. That is also true for the Inner Niger Delta. The Inner Niger Delta is a fully flood-dependent economy, being very productive in years with a high flood, but with very low yields in poor years. At present, weather satellites register clouds all over the world and produce estimates about the daily rainfall. This information has been entered in early warning systems (GIEWS, FEWS). So, the food aid agencies are informed about areas where crop failures are to be expected. The flooding of the Inner Niger Delta, and thus the yield of natural resources in the delta, is not linked to the local rainfall. Hence, OPIDIN provides an important additional tool as early warning system to (inter)national aid agencies. 13. Contribution to national policies and strategies. OPIDIN can contribute directly to some key aspects of national policies and strategies related to water and land management, directly to IWRM implementation in the delta and in the Niger upper basin and to conflict prevention; it can support appropriate decisions for a good balance between economic development and a sustainable environment; it can help the populations to improve food security through a better knowledge of hydraulic conditions; it can help regional authorities to take decisions about water and land sharing between competitive users ("calendriers de traversée"); it can help the Government and the international community to anticipate possible water crisis and food shortage and to plan earlier and adequate responses; and it can help everybody to take in account the effects of the global climate change and its impacts on the water availability in the Niger basin.